The Expansion Engine is vertical, single acting, triple expansion engine, reciprocating type. 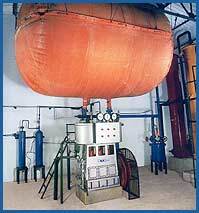 This produces the cold required for the plant. High- pressure air enters through inlet valve at the start of downward stroke of the piston. On further downward motion, the inlet valve closes and entrapped Air expands. During upward stroke, outlet valve remains open and inlet valve remains closed. heat content (enthalpy), thus the Air gets cooled. This cooling is more than that of an expansion in an Expansion Valve. An elementary factor for the function of an Expansion Engine is to use dry and carbon Dioxide free Air, as otherwise, ice and dry ice will form on valve seats, causing mal-function. The approx. temperature drop across Expansion Engine is 50 to 70°C, depending on inlet air pressure, temperature and inlet cam position. 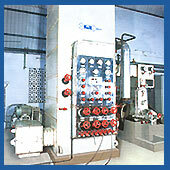 The Expansion Engine manufacturer consists of three major units. The cylinder unit handling the process Air consists of cylinder, piston, inlet and outlet Isolation Valve Assemblies. The Ball valves are actuated mechanically by a Push Rod as per the timing transmitted by the cam. The Push Rods are housed in a stuffing box to avoid Air leakage and are actuated by the hydraulic system. Pressurized oil container for valve actuation. Lubricate crankshaft and drive and drive unit parts . Lubricate the rolled holders .